So pretty 6mm Swarovski Crystal and toning Fresh Water Pearl Y-shape necklace with a matching Swarovski 14mm heart drop on a sterling silver heart link chain with a 2" extender. 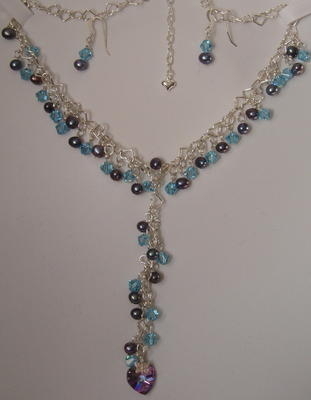 This necklace has about 50 pearl and crystal dangles. Necklace length is measured to middle of 'Y' with additional 4" centre drop. Matching delicate 4 pearl/crystal drop earrings included in price. Longer 2" chain drop or 2" chain drop with Swarovski heart earrings can also be selected. Can be made in a variety of colours to match dresses/outfits. 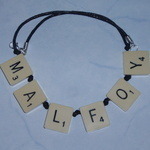 Please allow 3 weeks for delivery as necklace set is made to order.